Inspired by the comical characters in the Italian Commedia dell'arte, Steiff designers have created a brilliant miniature Teddy bear that's a delightfully different addition to any collection. 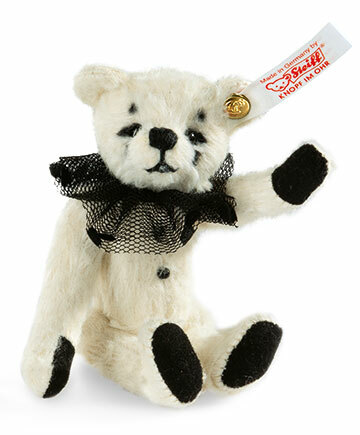 Sewn from lustrous white plush with black paw pads, Pedrolino is amazingly petite. He fits easily in the palm of your hand. Despite his small size, he's still wonderfully detailed. Tiny black glass pearls serve as the "buttons" on his costume. Around his neck he wears a tulle ruff with black polka dots. His face is painted in the classic Pierrot style. Like the characters on which he is based, Pedrolino is sure to bring a smile to your face. .